The art of losing isn’t hard to master; so many things seem filled with the intent to be lost that their loss is no disaster. Oh, must we dream our dreams and have them, too? What childishness is it that while there’s breath of life in our bodies, we are determined to rush to see the sun the other way round? Come like a light in the white mackerel sky, come like a daytime comet with a long unnebulous train of words, from Brooklyn, over the Brooklyn Bridge, on this fine morning, please come flying. All the untidy activity continues, awful but cheerful. The armoured cars of dreams, contrived to let us do so many a dangerous thing. The ship’s ignored. The iceberg rises and sinks again; its glassy pinnacles correct elliptics in the sky. This is a scene where he who treads the boards is artlessly rhetorical. All my life I have lived and behaved very much like the sandpiper – just running down the edges of different countries and continents, ‘looking for something’. What childishness is it that while there’s breath of life in our bodies, we are determined to rush to see the sun the other way around? 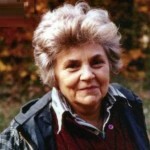 Elizabeth Bishop was born in Worcester, Massachusetts, USA. She was an American poet. Her first book, North & South, was first published in 1946 and won the Houghton Mifflin Prize for poetry. She received the Pulitzer Prize in 1956 for her collection Poems: North & South. A Cold Spring, the National Book Award for The Complete Poems, the National Book Critics' Circle Award in 1976, and many other distinctions and accolades for her work.